A number of new meters are now equipped with Near Field Communication (NFC), a contactless proximity technology that lets the meter interact with other IoT-connected devices, such as smartphones, tablets, in-home energy displays, contactless prepaid cards, smart appliances, and even electric vehicles. NFC lets prepayment meters accept payments from contactless smartcards, such as MIFARE, and NFC-enabled devices, such as smartphones. Prepayment meters also support the management of different tariff schemes, and can send usage statistics back to the grid via smartcard or phone. NFC supports track-and-trace functions, to ensure the right parts are used in the manufacturing process, and can upload firmware at any point in the supply chain for late-stage customization. 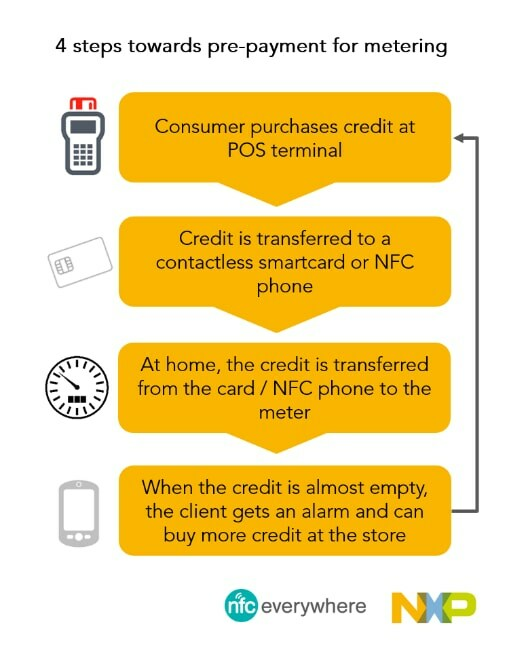 NFC’s fast pairing saves power and, when used to connect to a smartphone or tablet, enables a better, more interactive user experience. NFC can grant or limit access to certain people, for customized operations. Consumers can be authorized to view data directly, or a third party can be set up to manage readings and customer communication. NFC lets the meter speak for itself, by communicating maintenance due dates, sending service phone numbers and maintenance registers, or sharing usage tips. Maintenance personnel can also use NFC to load firmware updates or view error logs. When meters are connected to the IoT, there can be concerns about security. Unless the system is properly secured, NFC can make it possible for people to manipulate, sabotage, or misuse the meter. It’s been shown, for example, that the secret keys used to protect authentication can be extracted, simply by analyzing power consumption on the supply cables. Similarly, the fact that NFC supports software upgrades makes meters more flexible, but also susceptible to malware. Hackers can, potentially, use malware to have the meter (or any gateway it connects to) perform unwanted functions, or behave in unintended ways, such as a Trojan horse that can compromise the entire network. Fortunately, though, there are effective ways to reduce these risks and minimize vulnerability. The best approach is to equip NFC-enabled meters with strong authentication technologies that use tamper-resistant, hardware-based security components. Software-only solutions simply aren’’t enough. For truly secure authentication, the cryptographic keys and their associated cryptographic processing functions need to be isolated from software, and need to be protected by state-of-the-art, tamper-resistant hardware techniques that guarantee integrity and confidentiality at all times, whether the meter is actively in use or at rest. Hardware-based security functions are typically performed by a dedicated device, separate from the NFC circuitry. The meter can, for example, integrate an NXP A-series security IC, or use a secure access module (SAM), such as the MIFARE SAM AV2. Either way, the meter is equipped with a proven architecture that creates a root of trust, for a solution that is both secure and flexible. As a result, utility companies and consumers can enjoy all the benefits of NFC in meters, without the worry. Have you used an NFC-enabled meter? What’s your view on the security of present-day meters? How do you see the market for meters evolving in coming years?